Climate change is creating crisis conditions around water in the Western Cape, so encouraging people to use less water is a priority for local authorities. The Saldanha Bay municipality like others, is investing resources into awareness and behaviour change communication campaigns. GreenEdge was contracted to develop concepts and materials to assist in spreading the message. Our first recommendation was that we create emotionally positive imagery, rather than alarmist appeals – which can send recipients into negativity, denial, and non-action. 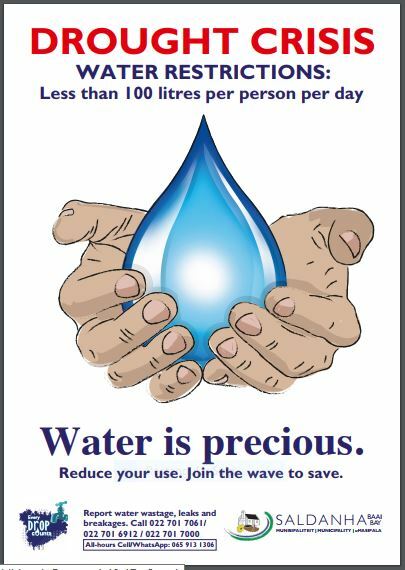 The core message we came up with is ‘water is precious’. This is followed by information on specific actions people can take to reduce their usage. A further component of the messaging strategy is an appeal to people’s tendency to follow the herd, hence “join the wave to save’ is repeated as a tagline in the communications. Street pole signage, shopfront posters, call-to-action leaflets for householders and stickers to place at the point of action (basins, sinks, toilets etc) comprise much of the distribution media so far. ‘Druppie’, a water droplet mascot also tours schools in the area with an edutainment song and dance routine with learnings children can take back to their families. The three strategic elements of the campaign – emotionally positive imagery, specific calls to action and appeals to group behaviour – work together in creating awareness of the crisis situation. More importantly, they aim at actions being taken to reduce water which become routine over time.